in any Niche on Search Engines! 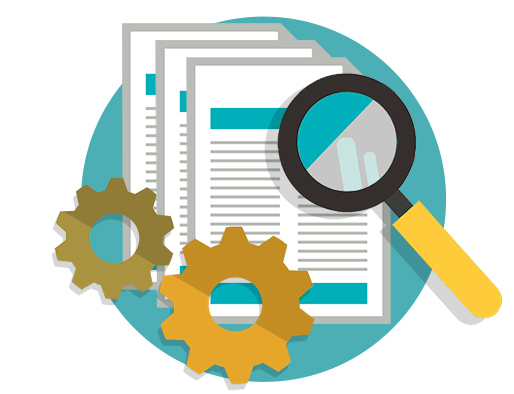 Our Sophisticated Automation Engine calculates automatically keyword and link diversity for search engines algorithms. SEO Autopilot’s Advanced Account Protection Feature and Posting Algorithm ensure that the created Accounts will stay active for a long long time! Our Amazing SEO Tool binds your accounts with specific proxies, therefore, you avoid getting banned and your accounts stay in good standing and they are active for a really long period of time if not “forever”…! Not only you have Full Control of your Link Profiles Creation but with SEO Autopilot you are able to select the exact position of your backlinks and keywords inside your Articles! This is by far one of the Most Powerful Features in SEO Autopilot Software for many reasons. 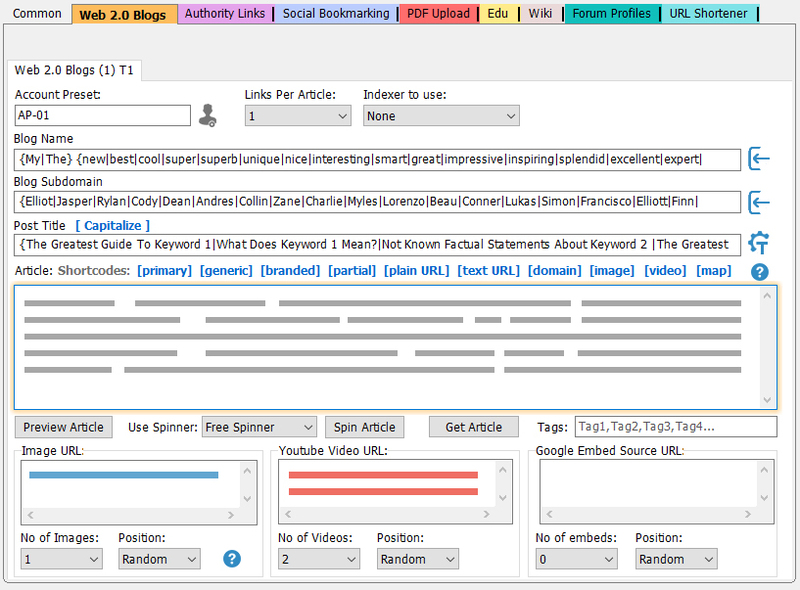 By using the Link Matching Feature, you are able to “Match” specific keywords to specific urls! Save tons of time and money by creating One single campaign for your e-commerce or your Multi-Niche websites! With a click of your mouse, you will have All the content you need for your SEO Autopilot Campaigns, from well-known sources on the web! Give a keyword and SEO Autopilot content crawler will fetch an article which is relative to your Niche. Spin your Article and you’re done! With a single click, you can turn any article into a completely new one, saving you time and energy you have already invested in creating quality content for your website. SEO Autopilot Spinner is lightning fast as well as free, so there is potentially no limit to the number of articles you want to spin! 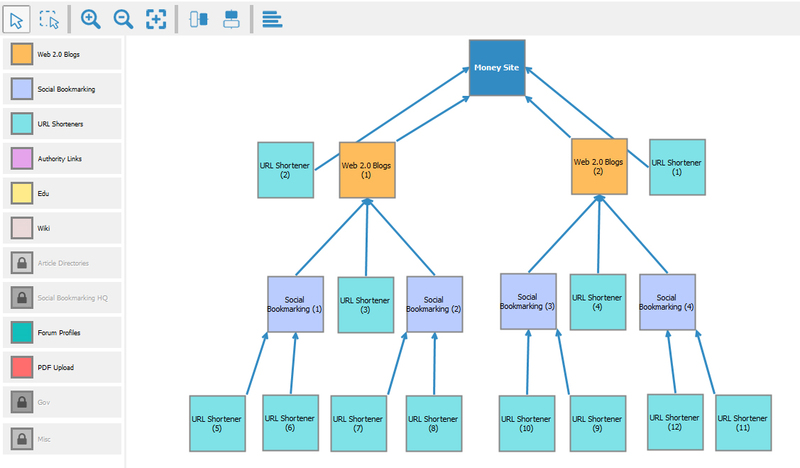 SEO Autopilot Software uses Real Duplicate Protection Algorithm (RDPA) that ensure unique keywords and links in each article. Unlike other “unprofessional” SEO Software that posts the same keywords and/or urls in an article which is “Spam” on Google’s eyes, SEO Autopilot’s RDP Algorithm ensures that each Article will have Unique keywords and URL’s! SEO Autopilot Software has a Huge Database of Quality High Domain Authority websites that will Skyrocket your website’s Visibility, Credibility, and Authority! Get Super High-Quality Backlinks from All Major Authority Websites with a Push of a Button, increase your own DA/PA and get the Rankings your website deserves! 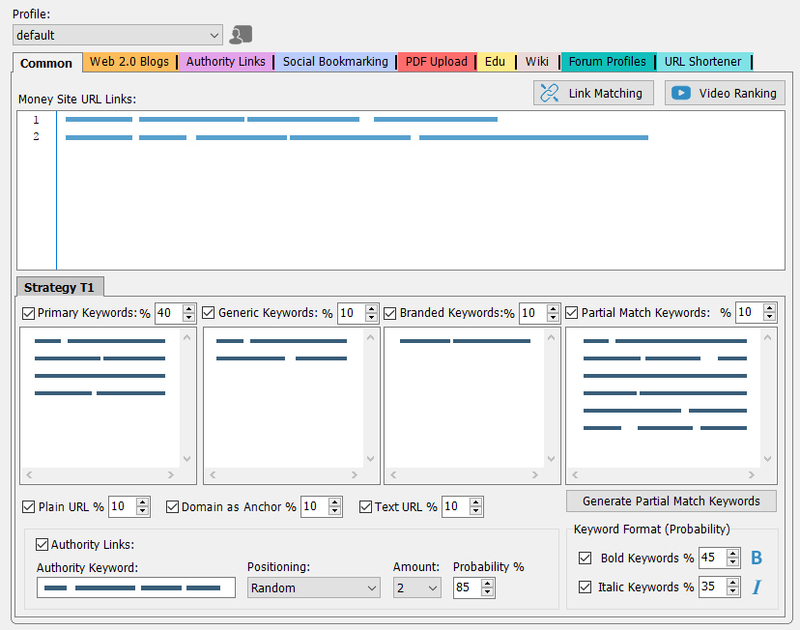 In SEO Autopilot Software you can use 10 types of keywords for maximum diversity. 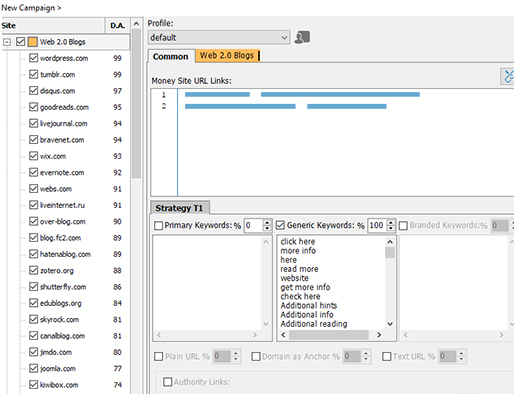 Articles keywords and links are calculated using a REAL Algorithm to ensure keyword diversity. Take 100% Control of your Link Profile Creation and Protect your website from Over-Optimization and SE Algorithm changes! Rank yours or your Clients local business on Google Maps listings using SEO Autopilot’s Embed Map Feature! 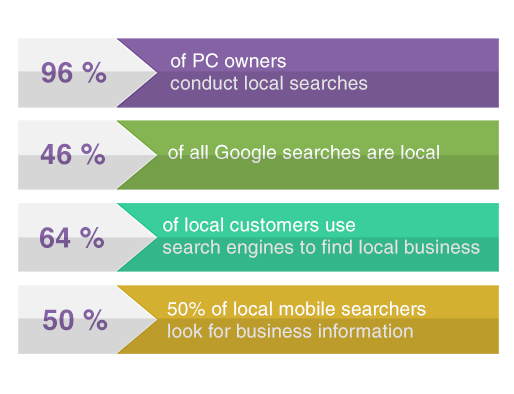 Increase your Local Visibility on SERP’s! 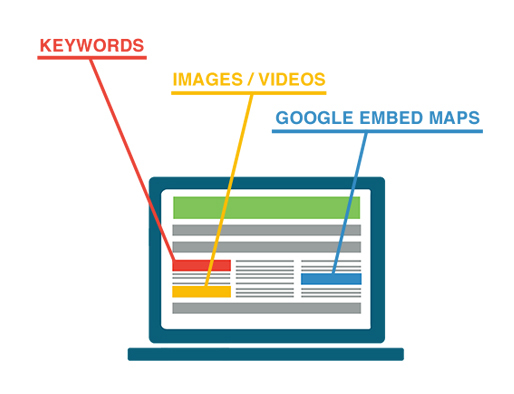 With SEO Autopilot’s Google Embed Map Feature, you can create beautiful and Multimedia Rich Posts to Authority Websites including different variations of an Embed Map of your Local Business! Rank your Youtube Videos on Google’s SERP’s and within YouTube’s internal search engine, using the Powerful SEO Autopilot Video Ranking Feature! 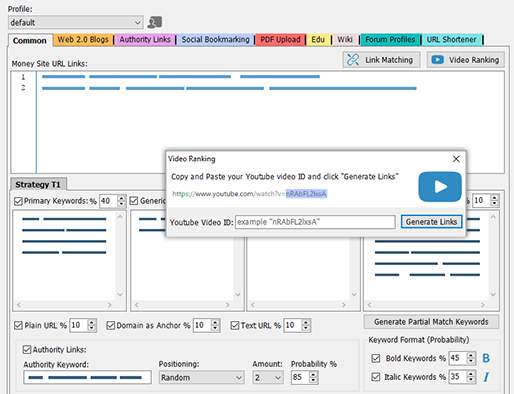 On campaign creation, you select the “Video Ranking” Feature, you enter your Video id, click create and SEO Autopilot will create 159 video url variations and place them under the moneysites field. Whether you want to Rank a New, Middle-Aged or an Established Website, SEO Autopilot will help you Rank ANY website like a Real Pro! Getting Quality backlinks from different Link Sources is one of the Most Important Factors in Quality Link Building which drives fast and Permanent Results! Customize each Link Group for each Tier with different settings for your needs. Create Diversity in your Multimedia Rich Articles and adjust your SEO Strategies easily. Create beautiful and Professional Looking White label Reports with your new backlinks, for yours or your clients SEO Campaigns! 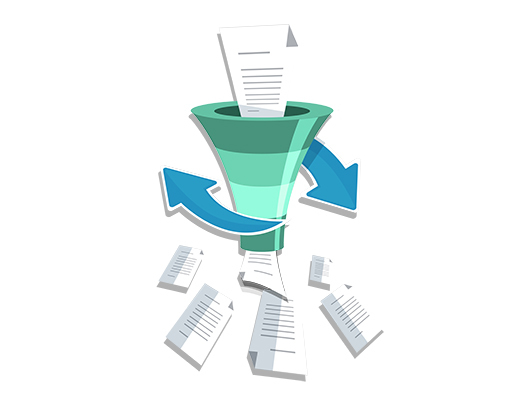 Use our built-in Diagram Editor to create your own link building scheme or use predefined schemes and use them in your campaigns. Create Advanced and Professional Link Building Strategies with Unlimited Tiers and Transfer Authority to your Moneysites for Maximum Performance! We offer FREE Premium Domains for Profiles and Accounts Creation which increase dramatically the Success Rates you’ll get! 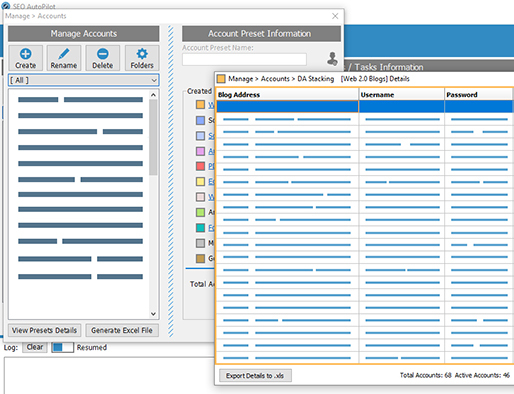 Just create an Account Preset, select the “Default” Profile Creation and SEO Autopilot will do ALL the Hard Work for you! Create your first campaign in minutes using Delphi based user interface. Developed by SEOs for SEOs. Our Simple yet Professional Looking UI design will help you to accomplish a given task as simply and efficiently as possible. 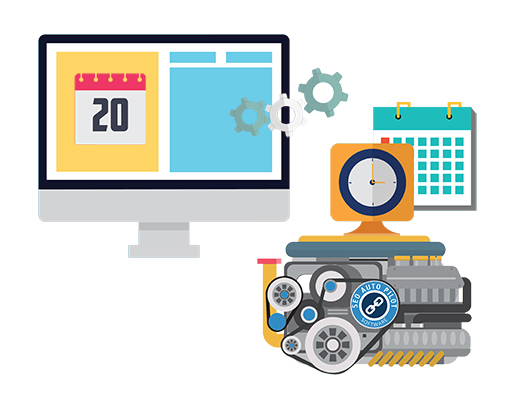 As soon as a user run SEO Autopilot Software, he gets a clear point of view of what he needs to do!